First revealed at CES in January, Retro-Bit's line of officially-licensed Capcom controllers are headed to retail next month. 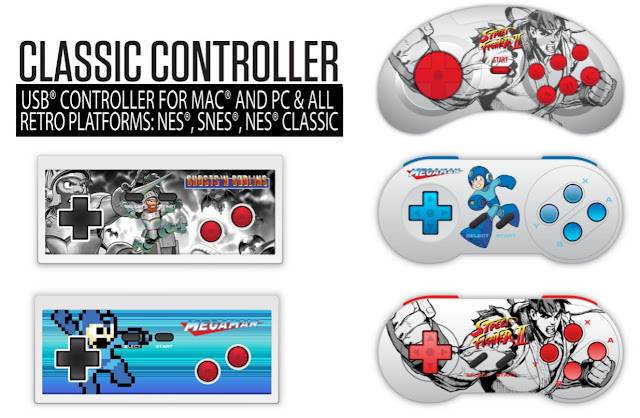 The controllers - USB-based NES, SNES and Mega Drive/Genesis pads - feature the likes of Mega Man, Ryu and Arthur. They'll set you back $19.99 a piece. According to Retro-Bit, we can expect to the controllers soon on Amazon, GameStop, Newegg, Micro Center, and Lukie Games. A number of in-store chains will carry them, too. A running list of stores is available at Retro-Bit's site. Works on PS4 and PS3 in addition to PC. So these also work on the original systems? Im not sure if Megaman's buster placement on the NES controller is terrible or genius. It leans terrible, would have been genius if the makers colored the start and select buttons yellow though. Could have at least diversified a bit and used an X series them for the SNES style controller and junk. Er... why are the Select and Start buttons where they are on the knock-off NES controllers? I mean, seriously... why? Can't really say anything one way or the other otherwise, I guess.